TEMECULA, CA—April 13, 2012— ProSites, the innovative leader in medical website design, has released a new Ocular Health Analysis survey for use on ophthalmology websites. This new feature enables doctors to create personalized recommendations for prospective patients based upon an assessment of their vision ailments; providing doctors with a greater opportunity to convert online prospects into new patients. 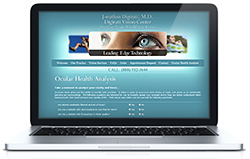 The Ocular Health Analysis survey is the latest among many free enhancements available for ProSites members. This unique new feature contains a fully-customizable set of Yes/No style questions that prospective patients can answer in the privacy of their own home. Once submitted, the doctor is able to review the responses and prepare a tailored list of recommendations for the patient prior to the first visit. "We are excited to provide another interactive tool that encourages communication between doctors and their patients," remarked Lance McCollough, founder and CEO of ProSites. "Interactive features such as our Ocular Health Analysis survey are designed to help doctors successfully connect with more prospective patients online, and ultimately convert them into new patients for their practice." Founded in 2003, ProSites has helped thousands of medical and dental professionals grow their practice through leading website designs and Internet marketing solutions. The company is renowned for its continuous innovation and superior website design services that make it easy for doctors to reach new patients on the Internet. With ProSites, doctors have are able to fully control and modify their website instantly, with a simple "point and click" user interface. The company's unmatched WebEngine technology allows users to edit content, add an unlimited number of pages, upload new photos and videos, and even change their entire website design at any time, free of charge. The firm has most recently expanded its services, providing the most effective and comprehensive online marketing solutions for medical professionals. From advanced search engine optimization (SEO) packages and mobile websites to local search marketing techniques and social media services, doctors are able to fulfill all of their online marketing needs with the industry's key innovator, ProSites. ProSites is a leading provider of website design and Internet marketing services for medical and dental professionals. ProSites delivers premium customizable websites integrated with search engine optimization (SEO) techniques, patient-focused content, and a collection of interactive features to help generate new patient appointments and streamline patient communications. ProSites has garnered numerous endorsements from elite associations nationwide for their advanced technology, superior website designs, and search engine marketing expertise. For more information, visit sbobet ฟรี 300 www.inouibook.com or call (888) 932-3644.